Unbeknownst to most gamers, there has been gnomish conspiracy to keep leprechauns out of fantasy roleplaying games. The INLA, Irish National Leprechaun Army, has been suspected of retaliating by slandering the gnomish image. Many historical documents depicting gnomes have been modified by adding conical, and comical, hats to traditional pictures of gnomes. The dunce-like gnome hat has been a debilitating image that gnomes have had a hard time breaking away from. To this day, gamers do not take gnomes as a serious race in most fantasy role-playing games. This concept has been exacerbated by human garden enthusiast who happily place the offensive, to gnomes, statuettes of the cheery hat wearing gnomes in their gardens. Anyone familiar with gnomish society knows that a true gnome would never don such headgear. This has cost many gnome illusionists from attaining advanced wizardly status because humans have no qualms about wearing a hat that was once reserved for misbehaving children. This has lead to the creation of the GLF, Gnome Liberation Front, whose main goal is the removal of as many garden gnomes from front lawns as possible. While many are familiar with GLF's existence, many are still unaware of their role in limiting the leprechauns playability. When roleplaying games were still in their infancy, gnomes and leprechauns vied for a place in the rule book. Initially overlooked as a stock race, they became more acceptable when the humans were looking to include halflings and hobbits. After initial studies concluded that a game with so many of the 'wee folk' would not do well, auditions between the races became quite competitive. For a long time, the bigger races, particularly humans, were very indecisive about which of the smaller races to include. Gnomes, being just as crafty as their fey cousins, opted for a different tactic to get them recognized as a player race. Instead of boasting of their own qualities as a playable race, the gnomes chose to highlight the leprechauns far superior abilities to themselves. The leprechauns mistakenly took the chance to enhance their own image as well as sell the big folk on additional abilities they did not have (Leprechauns have no affinity with rainbows and it will not lead you to their hidden cache of gold). This did not have the effect that the leprechauns anticipated; the bigger races unanimously came to the conclusions that leprechauns were too powerful to be used as a player race. This has stemmed a growing war between the gnomes and leprechauns that does not appear to end any time soon. After the dunce-cap campaign, the gnomes attempted to ridicule leprechauns by distributed propaganda with pictures of leprechauns on chamberpots. Luckily, the leprechauns, be able to turn invisible at will, were able to modify the pictures to depict pots of gold instead of chamberpots. Leprechauns retaliated by influencing the Brothers Grimme, for whom they owed a favor, by changing the story of "Snow White and the Seven Gnomes"; everyone knows dwarfs live underground. 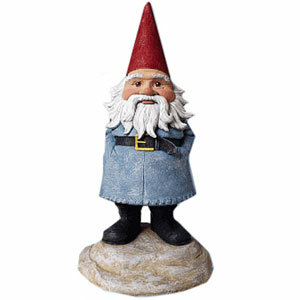 Because this was a treasured historical event in gnome history, the gnomes took this as a personal affront. The gnomes tricked leprechauns by inventing the story of the 'four leaf clover' and many ignorant leprechauns still spend their days in clover fields hunting the fictitious plant. The list of infractions on either side go on and on, but neither side is willing swallow their three feet of pride and turn the other cheek. Maybe one day both gnomes and leprechauns can have a place in the same fantasy game side by side as playable races. Until then, try to be a little more understanding of each of these races and what they have had to go through to be recognized in the RPG society.